I had posted the obscure Windows 95 reference disc in my Sales Thread years ago with information how to run it on new PCs. Now documented to include a full hard drive install option not available in the original software designed to run off the CDs. I included downloadable RAR files at the bottom and created a unique bat file to run the fully installed discs. Note that you still would need to purchase the Lucas Arts Star Wars discs, this is simply the fixes to keep the files below legitimate. 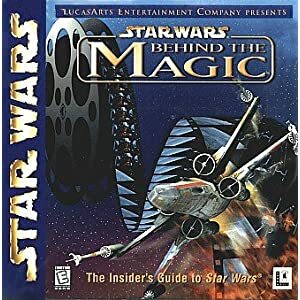 Star Wars Behind The Magic is inexpensive (links at bottom) due to not compatible to Windows 7 and newer Windows. The fix were first started by installing the program to Windows XP, copying the install folder over to Windows 7 and updating the Registry. Just a matter of putting everything together and creating a start bat file to handle multiple discs. The ideas presented here could be used for other Windows 95 games that have incompatible older 16 bit installers. The Star Wars reference set of discs can run in Windows XP, Windows 98 and Windows 95. It will run in a 64 bit Windows 7 only with the installer fix documented further down. Originally designed to run off the CDs to save hard drive space, I have created a full install to hard drive option so the discs once installed can be put aside. I think I just beat my own Find! One of the sellers is getting tired of losing money on Amazon Fees and did not wanted to just dump history in the garbage. Offered the entire lot to me for VERY CHEAP! So what am I going to do with 50 copies!!?? noiseredux wrote: Translation: my wife is going to kill me. I convinced the seller to keep a few, now I'll be getting 40 extra complete copies. The case came in, I broke it open and inside there are two smaller 12 pack factory boxes that have Lucas Arts Code Stickers. These look to be the original boxes that would be sent to a retailer! There are also individual sealed boxes piled on top for a total of forty copies! Okay not a game, but it does install in a PC. Its 1997 again or Windows 95! Bought still sealed, busted open the shrink wrap and breathed in air preserved from the last Century. Thanks to Dude and dsheinem posts I had to rebuy this. I installed this a long long time ago in a far away PC. Happy to report it works in WinXP when set to WIN95 compatibility mode, alas not in WIN7 64 bit. 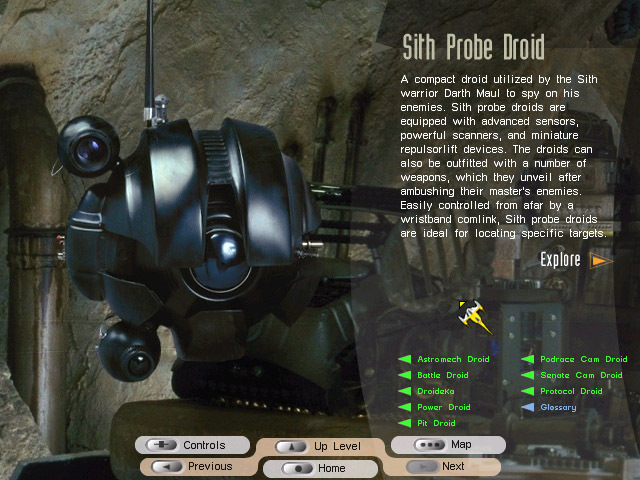 There is a program that will extract and boot the game code from another Lucas Arts game called Grim Fandango; maybe might work Star Wars Magic too? Ideally I'll see if there is an update 64 bit compatible installer and run file. Any Star Wars nut should have a copy, can get it cheap at Amazon. Nice to obtain this inexpensive maybe a future collectible for the exclusive though rough video footage. All kinds of pics, video and info from the original three Star Wars movies. Biggs is seen with Luke in the rare footage. I bought around 60 of these box sets like the one I sent you at a local machinery sales yard that sells outside and inside items. A bizarre out of place purchase on a pallet next to some tires & tool boxes. I think I bought the whole pallet for around $20. A purchase I regret if these end up getting thrown away. A purchase I do not mind if they can be used. I have 40 Star Wars Magic packed into a extra sturdy 24x18x16 box ready to ship. The shipping weight is 28 lbs. I put two boxes of 12 each on bottom of box. These boxes had not been opened and one still has an old sealed packing slip. Interestingly, it looks like these boxes were shipped from Amazon in 2003 as there was a packing slip still on one. CRTGAMER on January 7, 2012 at Amazon wrote: Star Wars Behind The Magic Encyclopedia discs are a treasure trove of information, far better then a web site or the extras in the DVD and BluRay movie discs. The user interface is detailed and keeps track backwards and forwards of all the pages you visited with multiple cross links. So much better researching with a mouse instead of using a remote to view a movie disc extra. Rare footage includes the lost video of Biggs with Luke. The amount of data stored in the pages of the discs is amazing. Find out each scene, character and ship in detail in how various props were created. All sorts of hidden Star Wars historical information is presented. Why does Han Solo's pants have stripes, who is Biggs, what ship is faster then the Millenium Falcon, see Chewbacca's family, the data just streams on an on. Wrap it up by answering a trivia questionnaire which has even more information. 1. Download BTM1.RAR and BTM2.RAR files at the bottom. 2. Extract and merge the files to the same BTM Folder. 3. Place BTM folder to root directory of Windows 7 hard drive. 4. Open the BTM folder and create two sub folders CD1 and CD2. 5. Copy entire contents including sub folders of Star Wars Disc 1 to CD1 folder. 6. Copy entire contents including sub folders of Star Wars Disc 2 to CD2 folder. 7. Open Registry folder, run the registry installer: "BTMx64 Install Disc Drive C CD0.REG". 8. Start the game by running RUNME.BAT which automatically renames selected folder to CD0. 9. IMPORTANT! Be sure to exit "Press X" in RUNME.BAT to correctly rename folders back to CD1 and CD2. 10. May the Force be with you. Enjoy! CRTGAMER wrote: The RUNME.BAT file can be added to the Start Menu. The icon from the original start file BEHIND.EXE can be imported to it. Note that the bat file is basically a "DOS" text file. I cannot emphasize enough about exiting the RUNME.BAT file properly (Press X) so that the file will rename the CD0 sub folder back to CD1 and CD2. 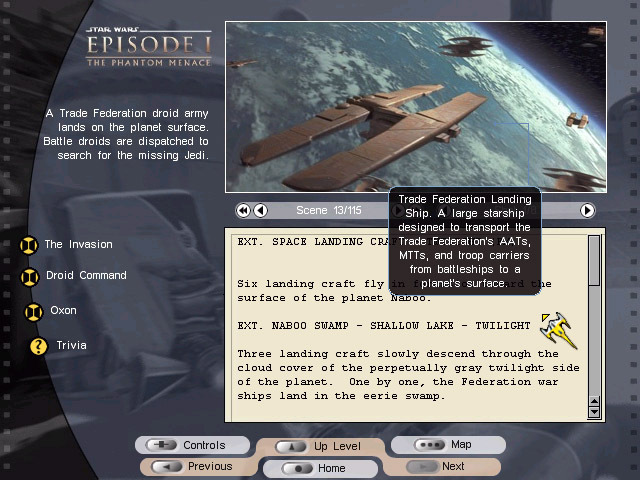 Once Star Wars Magic is exited (click Controls at the bottom of the screen); the Bat file might be hiding in the task bar. Bring it up to the desktop and follow the text prompts. Be sure to properly exit (press X) RUNME.BAT (MSDOS Prompt) when done. After pressing a key, the bat file will rename the CD folders back to CD1 and CD2. Star Wars Behind The Magic front end, click Start to begin. Nuts and Volts of creating your own registry files. No need to type, downloads are at bottom. NO NEED TO TYPE LISTING. THE ATTACHED BTM1.RAR AND BTM2.RAR AT THE BOTTOM CAN BE DOWNLOADED AND EXTRACTED TO THE WINDOWS XP BTM FOLDER TO RUN STARWARS FULLY INSTALLED. 1. Install Star Wars in Windows XP or older Windows or use the RAR files, set to default \BTM Folder. 2. Copy the Installed \BTM folder to a Mem Stick. 5. Copy paste the Install Text, Save and then run to update the Registry. Note D is the disc reader. 6. Create a shortcut of the behind.exe and add to your Start Menu. 1. Delete C:\BTM Folder and the Shortcut off the Start Menu. 2. Copy Paste and then run to update registry. Please feel free to leave a reply on success as well as review of Star Wars Behind The Magic. I think in today's age of convenient access online research many tend to miss out on valuable information on some older CD ROMs such as this. The reference CDs and hard drive install route means the information always available and not lost when a website goes away. 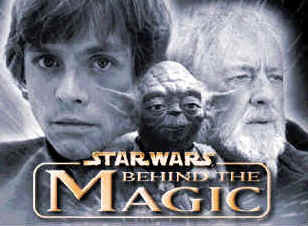 Links - Star Wars Behind The Magic only $5.00 shipped online! Great stuff hidden in the Star Wars Behind The Magic CDs. One of the prototype models. The boxes that came with the bonus Yoda Lithograph have a silver sticker on the shrink wrap that identifies this. I carefully split the wrap which now becomes a labeled protective liner for the Lithograph. Note that only the 1st edition release of Star Wars Behind The Magic include the Yoda Art Lithograph. My stack of software direct from Lucas Arts shipment boxes are not for sale, get your own inexpensive Star Wars at online stores. The information packed on to these discs was simply incredible. 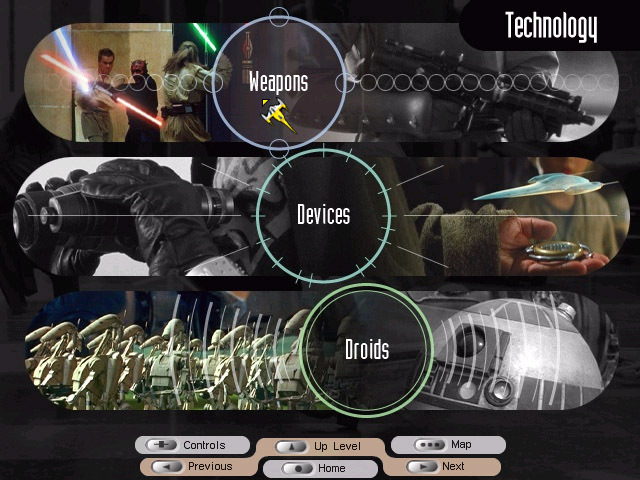 Selecting a category such as technology and then vehicles you could find out all the information you need on say a Speeder Bike. You would have options such as a full description of the bike or a gallery including a 3D model that would rotate so you can see every angle of the bike. You even got audio to hear the familiar sound of the bike and a video showing of course the speeder bike chase and Leia falling from her bike. It truly was a multimedia experience. Just like Wikipedia today you could start looking at one article and then you could click on something related or in the same category. Before you know it you’ve gone from looking at Speeder Bikes to a Princess Leia fashion show. Yes you read that right. On the discs were some funny 3D rendered scenes made especially for Behind The Magic. As mentioned we had a Leia fashion show which showed Princess Leia in her various costumes on a virtual catwalk with cameras flashing all around. The Expanded Universe was also represented and this I used a lot for cross referencing my Kenner Star Wars collection. Every figure was represented with a photo and some useful information on each one. It was like a menu virtual Steve Sansweet book. In fact it was Steve Sansweet who contributed to this section, sharing the impressive collection he had acquired even back in 1998. The last category was Glossary so you could look up every word relating to Star Wars. The best of these animations though was the virtual tour of the Millennium Falcon. Painstakingly recreated for the CD-ROM which was designed by artist, Dan Colon and David West Reynolds. For the first time ever, you could walk around a fully rendered Millennium Falcon stopping at various points to find out exactly what each component did. It was incredible! 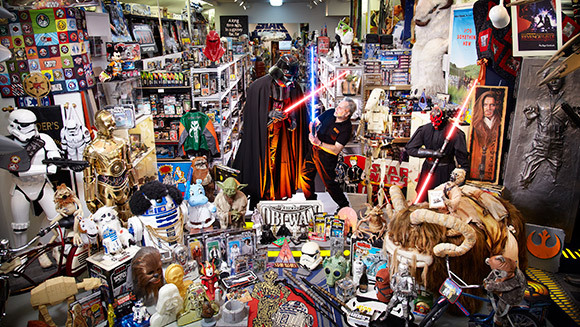 Steve Sansweet Star Wars memorabilia is amazing, the CD Rom shows part of the collection. Wookie Roar: "Get Star Wars Behind The Magic! May the force be with you." Last edited by CRTGAMER on Fri Mar 01, 2019 2:44 pm, edited 51 times in total. Is this like an official dodge to get around Windows doing that whiny blocking of 16bit installers? If so I'd love to find out if this would apply to Sim City Classic (and Civilization1) for Windows. I miss those two games and no one has ever bothered to fix them unlike so many others. Welcome to Racketboy Leia. It was your query back on Amazon that encouraged me to come forth with this new Guide with expanded info for the Windows 7 fix and now the full hard drive install work around. By asking the questions back on Amazon; thank you for reminding me to do this! I managed to make the game run on Windows 7 64-bit by following the instructions that are provided above. It occurred an issue though. When I tried to click on one of the features that are contained in Disk 2 of the game (such as Expanded Universe etc) the game asks me to insert Disk 2 in order to have access to those features.What should I do now? Insert Disk 2 of the game to my computer's BD Rom or I need to do an update or something else first so that the CD could be read by my computer's BD Rom? In the original Windows Fix, all you would have to do is swap CDs to the same disc reader when prompted. The Lucas Arts program did not allow two disc readers. I could have created a BAT file to allow two disc readers, decided to go all out with the convenient full hard drive install. Most discs of the day originally did not allow full install due to smaller hard drives back then and also as a form of copy protection requiring the disc inserted. 1. Rename your existing BLM folder to something like BLM Backup. 2. Download the two RAR files in the OP and follow the instructions including updating the Registry. 3. Move BLM to root of hard drive. 4. Be sure to copy the entire CDs to folders created as described in the OP. 5. Create a shortcut for RUNME.BAT and place in the Start Menu. 6. Once confirmed the new replacement BLM folder works, you can delete the older BLM Backup folder. Please feel free to leave your reply on success as well as your review of Star Wars Behind The Magic. Spoiler below contains important images and info for use in the OP. Be sure to properly exit RUNME.BAT (MSDOS Prompt) when done watching Star Wars. Last edited by CRTGAMER on Sun Aug 20, 2017 12:01 am, edited 14 times in total. In the OP, the RAR files and instructions are a Windows 7 64bit fix particular to the Star Wars Behind The Magic Win 95 discs. Other Win 95 games that have 16 bit installers with 32 bit run start files can be made to work in Win 7. The trickiest part would be to locate related to install INI files or Registry entries in REGEDIT.EXE Windows 95 or Windows XP folders. I think a game installed in Windows XP install would be easier to recode; any older INI files pretty much will be in the Win XP Registry making the conversion to Windows 7 Registry easier. 1. Install a game in older PC with Windows 95 or Windows XP PC in compatibility mode. 2. Locate the INI or Registry files related to install. Copy, Edit to create new registry installer. 3. Copy folder installed in older PC to newer Windows 7 PC. 4. Run the newly created Registry installer; see my example (Nut Bolts Spoiler) in OP to get the coding idea. 5. Once the CD method worked out, a created RUNME.BAT file for multi disc game needed for a Win 7 full hard drive install. Spoiler contains my next fix; Episode 1 Guide Win 7 fix further down. Last edited by CRTGAMER on Fri Mar 01, 2019 2:01 pm, edited 3 times in total. Updated the OP with more info, expanded review and pictures. Okay, here is something very useful for the Trivia game. The entire answers to all the questions located by exploring the CD Roms. The categories in the questions show the amount of detail that are in the reference discs. I also included the original Trivia Answers.txt attached below. Anyone who is a Star Wars fan should get Star Wars: Behind the Magic as soon as you can. 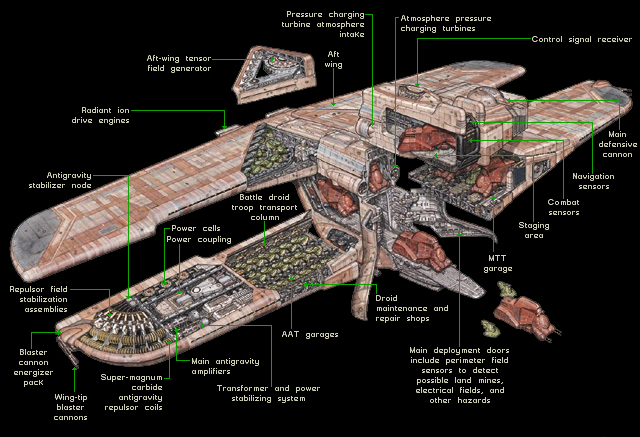 It is the most comprehensive collection of Star Wars knowledge I have ever found in one place. 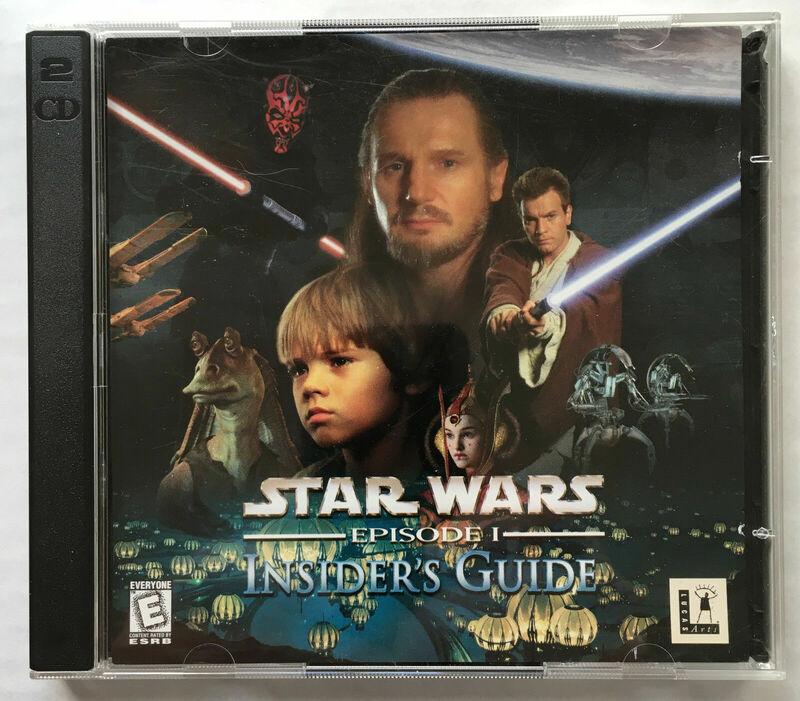 With that said, anyone who has it knows of the trivia questions placed throughout this two CD guide to Star Wars. Some of the questions are fairly easy while others tend to be a challenge. In any event, trying to answer them all and get a perfect score of 300/300 is a challenge even a Jedi Master would find trying. I've compiled all of those answers in this here easy to use guide. No worries in clicking the spoiler, only the category and answer code are shown. Note: (X) means there is no question. Note: For every instance that there is more than one trivia question per page, I list the answers in order of the questions. This FAQ was written by and copy written to Josh Murray. Lucasarts Entertainment Company and Lucasfilm Ltd. Note for cheaters that want to get the perfect "bowling game" score of 300, do the following. 1. Download and open the Trivia Answers file, be sure it is windowed view mode. 2. 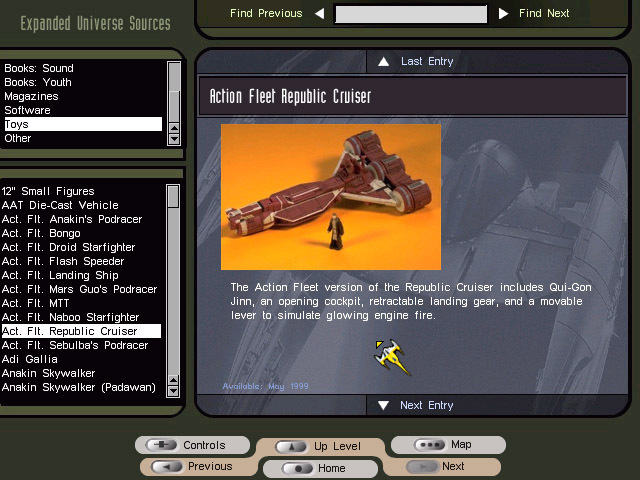 Run Star Wars Behind The Magic; press ALT ENTER to view in windowed mode. 3. Have care not to click close on the RUNME.BAT file. 4. You can now answer the questions jumping between the program and txt file answers. 5. Be sure to exit Star Wars properly by clicking the Controls and press X in the RUNME.BAT. 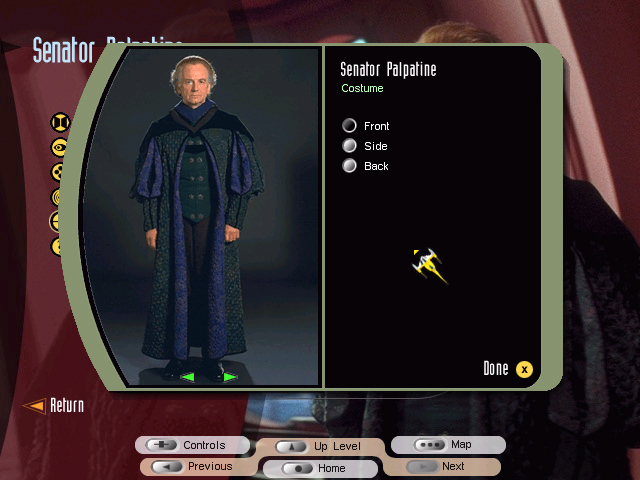 One of the Trivia Question screenshots, guess which Light Sabre before looking in the spoiler above. Is there any chance that you would have an "installed" version of the Star Wars Insider Guide as to make it work the same way? The Star Wars reference set of discs can run in Windows XP, Windows 98 and Windows 95. It will run in a 64 bit Windows 7 only with the installer fix further down. Originally designed to run off the CDs to save hard drive space, I have created a full install to hard drive option so the discs once installed can be put aside. The download is only the installed run files, you will need to purchase the Episode Insider Guide CD Rom 2 disc set to copy all the main data. The CD ROMs can be found on Ebay and Amazon. Note each section having a 1 or a 2 which indicates which disc. 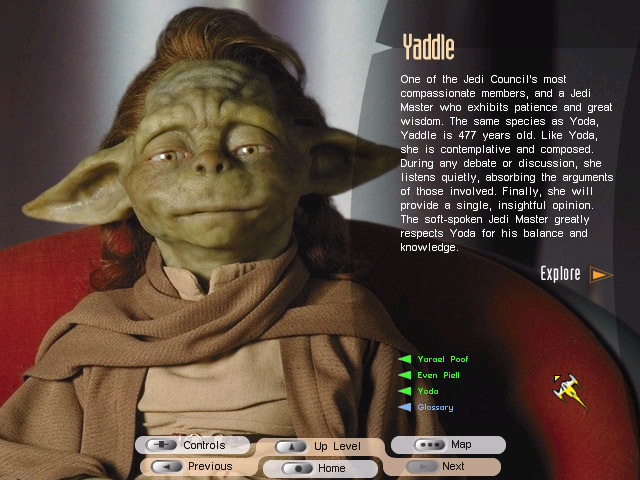 To "swap" the virtual disc, first choose Control and then exit the Star Wars program. The RUNME.BAT file running in the background can then be used to virtual select the other disc and reload the Episode 1 Guide. Just like the Making Magic Reference, Episode 1 Insider Guide a treasure trove of pictures, video clips, and sound clips. Look for conceptual art, behind-the-scenes pictures, interviews of George Lucas and producer Rick McCallum. There is also a 400 Trivia Question placed thru out the reference pages; test your knowledge of the film. The scene by scene description with matched scene picture reference as you read thru the pages. There is also a glossary of all the official Lucas Arts collectables listing books, toys, figurines, sound tracks and other software. The reference has so much information not found on the DVD or Bluray discs. So much easier to go thru the screens with a mouse click instead of using a player remote. 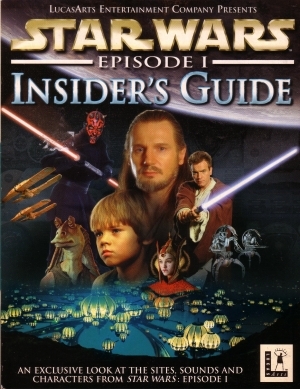 Some of the behind the scenes videos are exclusive to the Insider Guide; the guide an instant reference vs searching online. 3. Run the LucasArts Entertainment Company LLC.reg file to add to the Windows Registry. 4. Create Folders CD1 and CD2 in the EPIGUDE directory. 5. Copy Disc 1 BUNDLE.000, BUNDLE.001 and EPIGUIDE.EXE to CD1 Folder. 6. Copy Disc 2 BUNDLE.000, BUNDLE.001 and EPIGUIDE.EXE to CD1 Folder. 7. Copy from C:\EPIGUIDE\EPIGUIDE.EXE to both CD1 and CD2 folders. 9. Always start the program thru the RUNME.BAT file which automatically renames selected folder to CD0. 10. IMPORTANT! Be sure to exit "Press X" in RUNME.BAT to correctly rename folders back to CD1 and CD2. 11. May the Force be with you. Enjoy! CRTGAMER wrote: The RUNME.BAT file can be added to the Start Menu. The icon from the original start file EPIG.EXE can be imported to it. This screen requiring the CDs no longer needed, a full installed hard drive RUNME option. Episode 1 Insider Guide installer file will not run in Windows 7 64bit. I have a Windows XP 64bit tower intentionally set to 32 bit for compatibility of the older Windows 95 programs and games. Installed the CD Rom run files first to the Win XP PC, then created Registry and RUNME.BAT files. The Windows XP PC needs the CHOICE.COM file from DOS for RUNME.BAT to work; Windows 7 does not need the Choice file; just the Runme file. The Registry Installer I extracted and then edited the read pointer of CD Rom disc changed to the hard drive CD0 subfolder. Since the two discs have identical file names; each are contained in separate CD1 and CD2 folder. The RUNME.BAT file renames selected virtual disc to CD0 to match to the Registry. The RUNME.BAT file for Episode 1 guide is different from the file I created for Behind The Magic at the top. For simplicity in creating folders and edit; Episode 1 Guide are installed in the root of the hard drive keeping same folder name and not the default location under the program files folder. Important to always start the program thru the RUNME.BAT file with proper exit (press X) to keep the subfolders renamed in order. RUNME.BAT File contents - No need to type these out, the files are attached downloads below. REGISTRY INSTALLER File contents - No need to type these out, the files are attached downloads below. Download all three attachments and extract the RAR files to your created C:\EPIGUIDE folder.